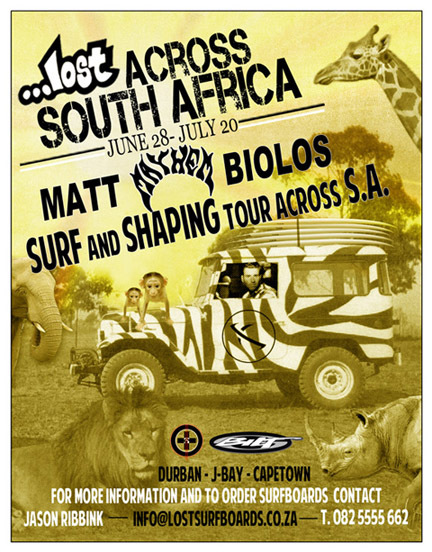 From Durban, South Africa: Shaper to the stars, Matt Biolos of …Lost Surfboards will be doing a tour of South Africa around the month of July. Matt will be starting off in Durban, visiting Jeffreys Bay, and heading for Cape Town on this month-long stint that runs from June 28 to July 20. Matt is known as the shaper who owns summer, with many of the models in his …Lost range of boards the perfect shapes and designs for having fun during the smaller summer months. Matt’s boards are some of the most popular boards in the world, and Matt will be introducing many of these shapes to South Africa for the first time. Matt will be hosting infomal meet-and-greets in all stops where interested members of the public can meet and have a beer with him. Have a look at a few of his latest boards, and discuss boards, shapes, volume, new technology and latest trends. While Matt and his “Mayhem” shapes might have the fun summer board theory covered, he is also shaper to some of the best surfers in the world, making boards for Taj Burrow and Kolohe Andino on the World Tour and Carissa Moore and Tyler Wright on the Women’s World Tour to name a few. Then there are also the …Lost Team riders, with the infamous Chris Ward and the always entertaining Mason Ho on the team books. Matt is adept at analysing surfers and their skill levels and experience, correcting poor equipment choices, and advising on possible equipment needs for surfers. From World Tour wave tools to the domesticated weekend warriors, Matt gives equal focus to all. For regular …Lost clients, Matt will be making custom orders whilst in South Africa, as well as showcasing his latest boards to the South African surfing public.